After a month of RV shopping, Kim and I took a breather for the holidays. We continued to chat about the subject with friends and family, fishing for feedback on our our plans, but we only casually browsed Craigslist. We didn’t venture out to the used RV lots. After the new year, though, we got back to work. We found a handful of listings that looked promising, including a 23-foot Born Free Class C motorhome. Not all motorhomes are created equal. Most are merely mediocre. They use cheap materials, have slipshot construction, and aren’t designed for long-term, full-time travel. 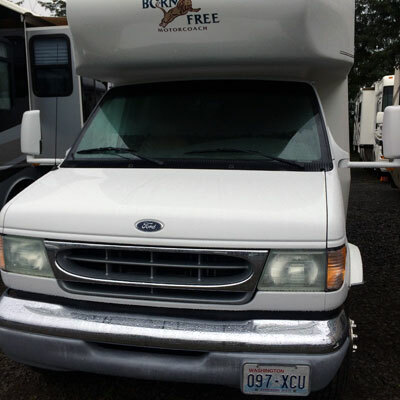 There are reasons RVs depreciate so quickly. Some motorhomes, however, have stellar reputations. From my research, Lazy Daze and Born Free coaches belong in the top tier. They’re well-designed and built from quality materials. People prize them, which means they hold their resale value well. On Sunday, January 4th, Kim and I took a trip to Wilsonville to look at the 23-foot Born Free. The coach was beautiful. It was easy to see why Born Free coaches are held in high esteem. The cabinets and fixtures were top quality, and the layout was maximally functional. If our plans were different, we might have pursued this motorhome. But because we intend to spend six months or a year on the road, it just wouldn’t work. In a 23-foot coach, the bed is over the cab, meaning one person has to climb over the other to get up. Plus, there’s no separation of sleeping and living space. If this rig had been five feet longer (with a bed in back), we probably would have pursued it. Right away, this new Bigfoot felt like home. The current owner, Mike, had purchased it from the original owner, and both parties had taken good care of it. Apart from a few dings and a layer of cat hair, the coach seemed to be in stellar condition. As a bonus, this Bigfoot had a slide-out whereas the previous one had not. This small addition made the living area feel much larger. “Have you had any problems with this RV?” I asked Mike. “Not really,” he said. “It did develop a roof leak last summer, but I patched it up. Plus I purchased an RV cover just to be safe.” Kim and I chatted with him for about twenty minutes before heading home. After showing the inspection video to Kim, she and I agreed we wanted to buy the Bigfoot. “But let’s take it for a test drive first,” I said. That Saturday, we joined Mike and his wife for a half-hour drive around Portland and Vancouver. Except for some minor wandering (typical of many RVs, I understand), the coach handled like a charm. Thanks the offer on Bigfoot. I’m excited for you and Kim — I know you’ll enjoy it as much as Sue and I did. It really is the top of line motorhome. As far as the offer, I think the $38,000 is fair because I’m including the motorcycle ramp and the new cover. The truth was, we agreed with him. Three days later, I met Mike at his credit union and handed him a check for $38,000. He turned over the title to the Bigfoot. Kim and I were now the proud owners of a motorhome. Time for the adventures to begin! This is a test comment. Nothing to see here. Move along. I am also about to begin my journey on buying a Bigfoot. I live near Virginia Beach and have yet to find one that I can look at so am very interested in any updates you might provide. I do have a 2006 30MH29g winterized Bigfoot for sale if you is still interested. You can find it on San Diego Craigslist. Just contact me through that link if you would like to know more.